Tryouts are held to identify players and place them on teams. The season is all winter, November through March. The cost is $310/child for competitive and $270/child for rec. 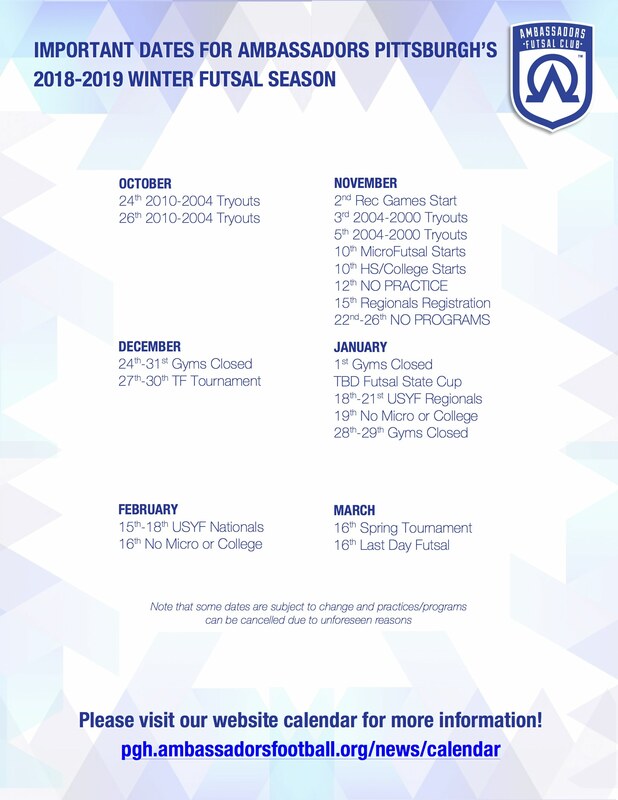 The goal for our competitive teams is to participate in the Regional and National Futsal Tournaments. Our competitive teams play once a week on either Saturday or Sunday with weekly practices. Rec teams play at Oliver High School on Fridays November 2nd- December 21st. Then January-March Elementary Fridays at West Penn Rec Center and Middle School Mondays at South Market House. Micro Futsal for K-2nd graders will be Saturdays, 9-10am at Brashear High School. $50/player. This is an introduction to futsal for all level players. High School/College Pick-Up will be competitive on Saturdays morning/afternoon at Brashear High School. $100/player. For more information or questions please email Melia Major at pgh@ambassadorsfootball.org.